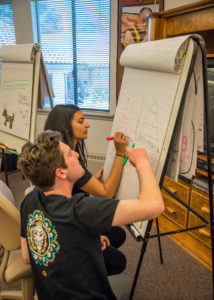 For the past decade, we have been using the Dalai Lama’s book, Ethics for the New Millennium as a core element of our senior year “Values in World Thought” curriculum. The program has been privileged to travel to India on three different occasions to meet, discuss, and ask questions about what we have learned from His Holiness’s book. This year, the senior class has been working on a booklet, which grew directly out of our classroom processes. 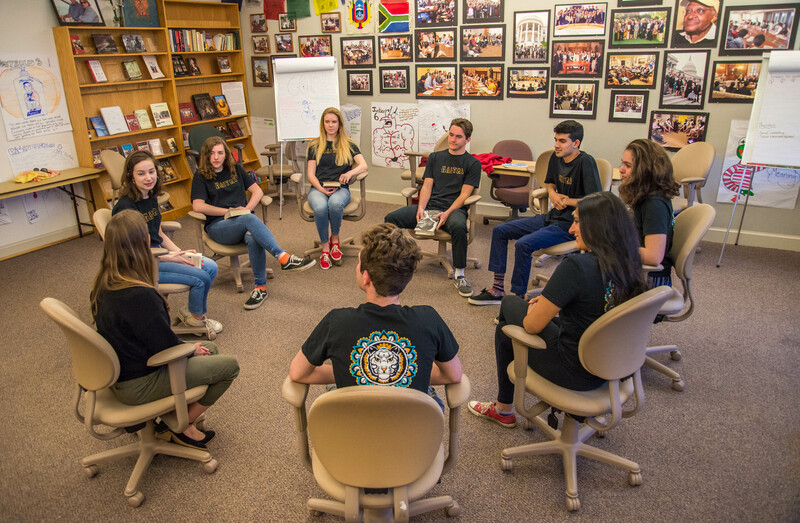 In our study of Ethics for the New Millennium, the students read each chapter, and in class they divide in to small groups to discuss the readings. Each group chooses concepts that they view as significant and then they create visual notes (drawings and quotes on poster sized pads) that illustrate the main points of the book. These visual notes become the source of the classroom conversations which in turn, help cultivate student understanding of this important book. 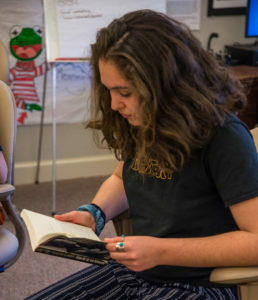 We find that giving students the space to reflect on the reading and then choose for themselves what is meaningful and what they wish to discuss, deepens their connection to, and understanding of, His Holiness’s thoughts. It has been six years since we have had the great privilege of seeing His Holiness. When we heard that we might have the opportunity to meet with the Dalai Lama during our senior trip to India this year, we had an idea to compile some of our visual notes, along with quotes and student thoughts, into a booklet to present as a gift. This was one of those pivotal moments when you give an enthusiastic “yes” to something that is yet to be defined and then discover what needs to be done to accomplish the goal. The booklet is the result of that “yes.” It is the culmination of many hours of sincere effort, creativity, experimentation, failure, perseverance, and the belief that we had something important to share. Ultimately, it is a testament to the reality that the best learning happens when teachers become facilitators and let students determine what is meaningful and relevant to them. We look forward to sharing our Learning Journey to India with you which will encompass a wide range of experiences, cultures, and insights into communities that are at the same time both very different and similar to ours. The meaning of Maitri is “friendship”. I have been here in India for over a month now working at Sri Ram orphanage and school, one of the many stops on the students’ journey. I always look forward to meeting the group at Indira Gandhi International Airport in Delhi and watching their first impressions of India as we drive to our hotel in Delhi. This year we have reversed the routing of the trip and will be flying to Dharamshala on the second day to meet and speak with the Dalai Lama. This is an almost unimaginable privilege. It has been six years since one of our groups have met him. The students are always smitten with his infectious good humor and kindness. Besides the Dalai Lama, they will meet and speak with several of the most remarkable people to be found in India, such as Rinchen Khando, founder of the Tibetan Nun’s project, Dr. Kshama Metre, Director of CORD (the Chinmayananda Rural Outreach and Development project), and poet Kamla Bhasin, one of India’s foremost feminist activists. Just as importantly, the students will meet the other branch of the Mount Madonna family at Sri Ram Ashram. This is the orphanage and school founded by Baba Hari Dass, who as most know also inspired Mount Madonna Center and Mount Madonna School. We will spend four days at the ashram before going to meet the wonderful students of Pardada Pardadi School founded by Sam Singh and Renuka Gupta to serve girls in a very poor rural area east of Delhi. Finally they will meet for a day workshop with the equivalent peer group in one of India’s finest schools, Step by Step, in Noida. In between the big events they will experience the amazingly kaleidoscopic world of Indian life. In preparation, I urge the students to leave expectations at home and simply allow the experience to happen as it does. They will learn whatever they are ready to learn and the unpredictability is part of the “secret sauce.” The trip is well organized with a great support network and all the arrangements are well in place. One thing is reasonably certain: India is never completely predictable, so they will need to keep an open mind and take the experiences as they come. It is a certainty they will meet memorable people at all levels of this incredibly diverse society and learn a great deal about themselves in the process. Please stay tuned for the upcoming Journey to India by Mount Madonna School seniors, The Maitri Project. The journey will begin on March 23, 2019. Check back for updates, writings, photos, videos of the journey.